GreenWheel Food Hub is hosting “Preservation Celebration,” a pop-up food shoppe and series of events showcasing methods of preserving Hawaii’s locally-grown foods. This four-day series of tasting and skill-sharing events launches their Indiegogo crowd-funding campaign to raise $15,000 to purchase a Combi Oven with which to produce their “GreenGoods” line of sauces, pickles and preserves. In order to support EBT service at local farmers’ markets, GreenWheel Food Hub has developed a line of value-added products created out of surplus produce from local farmers. This addresses two critical needs in the local food system: providing farmers additional income from surplus and off-grade produce that might otherwise go to waste, while increasing access and affordability to locally-grown foods by supporting EBT service. Proceeds from this line of value-added “GreenGoods” generates income to pay for community services such as SNAP/EBT (fka “foodstamp”) acceptance in farmers’ markets. ”Preservation Celebration” events will be held July 18-21, 2013 at the R&D gallery space at 687 Auahi Street in Kakaako. 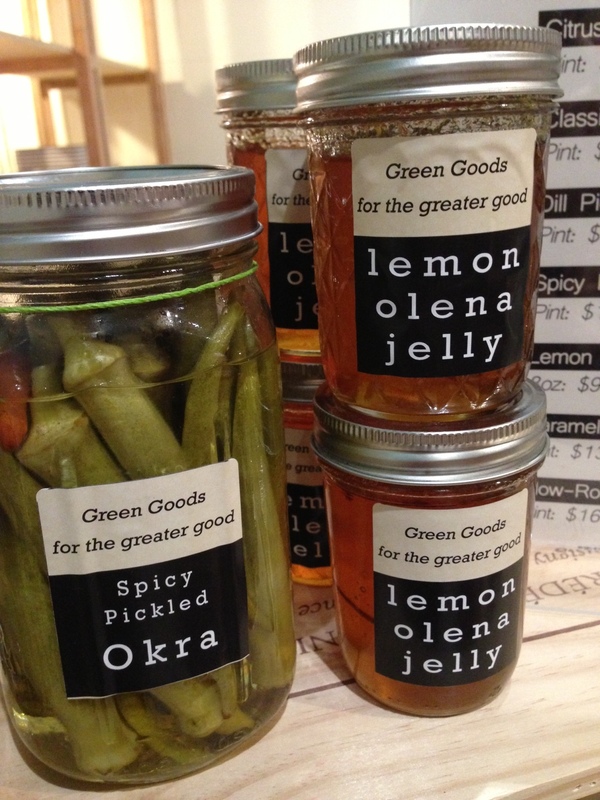 The GreenGoods food shoppe will feature locally grown and preserved food items from Hawaii’s artisan food preservers. 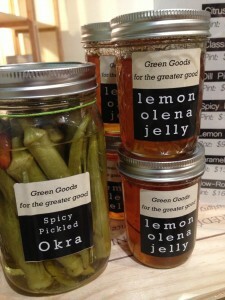 A rare chance to visit with the best of Hawaii’s artisan food preservers and ask them about their craft! Taste through the array of GreenWheel GreenGoods pickles, jellies and jams. Enjoy freshly sliced charcuterie from Salt Bar & Kitchen and hand-crafted one-of-a-kind cheeses from Naked Cow Dairy. Try pa`i`ai, grown and pounded by the young farmers at Kako`o `Oiwi, freshly baked artisan breads by up-and-coming Tante’s Bakery and a tasting of Island Distiller’s Hawaiian Vodka mixed with 100% local GreenGoods syrups and locally made Hawaii Bitters. 9:00am – 10:15am: Learn to make tsukemono (Japanese pickles) with GreenWheel’s EBT Transaction Coordinator Nanette Geller, a long-time resident of Japan and accomplished home chef. 10:30am – 11:45am: Learn to make charcuterie (prepared meats) with Salt Bar & Kitchen’s chef Doug Kocol – featuring pig and rabbit from Shinsato Farms! GreenWheel Food Hub hosts the “Green Grocer” at the monthly Honolulu Night + Market in Kaka`ako. This food shoppe will feature tasting plates and take away preserved goods from the local artisans participating in the weekend’s events. Support GreenWheel Food Hub with a lazy Sunday al fresco brunch featuring locally-made english muffins from Tante’s Bakery, poached Wai`anae Rainbow Eggs, local cheese from Naked Cow Dairy, local bacon cured by Chef Doug Kocol of Salt Bar & Kitchen, GreenGoods tomato jam, and taro hash from Kako`o `Oiwi. Wake up with Waialua Coffee , meyer lemon spritzers and an all-local build-your-own bloody mary bar featuring GreenGoods pickles and bloody mary mix, fresh locally veggies and Hawaiian Vodka ! GreenWheel Food Hub is a social enterprise with a mission to help Hawaii’s residents, especially those in low-income communities, gain better access to fresh, locally-grown fruits, vegetables and staple foods. For more information about GreenWheel Food Hub’s project to bring SNAP/EBT acceptance to local farmers markets, and to purchase tickets or contribute to the fundraising campaign visit www.greenwheelfoodhub.org. GreenWheel Food Hub is a fiscally-sponsored project of Feed the Hunger Foundation, a 501(c)3. This entry was posted in Events and tagged fundraiser, greenwheel, preservation. Bookmark the permalink.